1X USB 3.0 External Hard drive Enclosure. - USB power supplied, no external power needed. - 1X 30CM in Length USB 3.0 Cable. - Support hard drive up to 2 Tera Bytes. - Clear ABS Heat Resistance material. 1X USB 3.0 External Hard drive Enclosure. - USB power supplied, no external power needed. - 1X 30CM in Length USB 3.0 Cable. - Clear ABS Heat Resistance material. - Support hard drive up to 2 Tera Bytes. 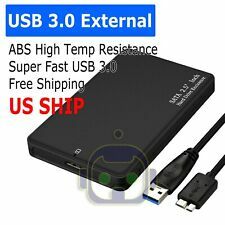 Turn any 2.5" SATA hard drive into a SuperSpeed USB 3.0 external hard drive USB 3.0 Interface (legacy support for USB 2.0) Compatible with 2.5" SATA hard drives (all capacities) Compatible with Windows 10/8/7/Vista/XP, Mac OS X, and Linux No drivers needed Turn any 2.5" SATA hard drive into a SuperSpeed USB 3.0 external hard drive. External hard drives are great for backing up information, moving files, and adding extra storage without opening your computer. Connect it to the USB 3.0 or USB 2. Seagate Expansion Desktop External Hard Drive USB 3.0 Enclosure upto 8TB SATA. Portable design. Superspeed USB 3.0 interface. 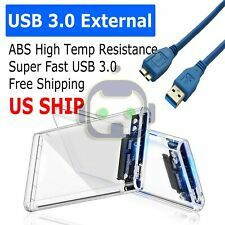 USB 3.0 cable (not included) is needed. 12v power adapter (not included) is needed. Extend your data storage ability with this hard drive enclosure. Fits SATA drives of 3.5" only. Transfer data and files to your PC at 480 Mbps over USB cable. All necessary cables are included. An indicator light shows read/write activity and the case features an on/off switch. PLEASE NOTE: You must be sure of your hard drive type before ordering. A SATA drive has small, flat plastic tabs where the power & data cables connect. An IDE/PATA drive has a row of 40 pins. Support HDD Thickness: 9mm or Below. 1x Hard Drive Enclosure(A ccessories are not included ). Product Specification Safety Approval: CE / FCC / RoHS. 1x User’s Manual. 1x Original box. (E.g. you brought wrong size or wrong item). HDD Compatible: All 2.5” / 3.5” SATA HDD and 2.5” / 3.5” IDE HDD( NOT fit for Western Digital IDE ). 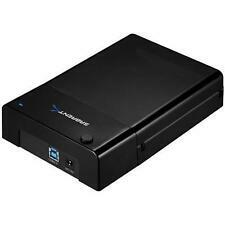 This is perfect 2.5″ / 3.5″ IDE & SATA hard disk docking and card reader. 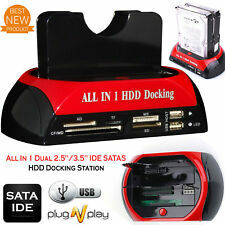 1 x IDE SATA HDD Docking Station. Convert an M.2 NGFF SATA SSD into a standard 2.5" SATA III 6Gb/s drive. For B key drives with SATA support only. Does NOT support NVMe PCIe SSDs. Does not work with M key drives. See second photo. Adapts the power and connectors only. The M.2 drive communicates directly with the SATA controller. Works with laptops, desktops, and SATA enclosures; anywhere a SATA SSD would work. Compatible with 2230 (30mm), 2242 (42mm), 2260 (60mm), and 2280 (80mm) M.2 drives. Dimension: 100x70x7mm . USB 2.0 2.5 SATA HARD DISK DRIVE HDD CASE ENCLOSURE. nternal Power and Data - SATA (Serial ATA). Made strong with Aluminum Magnesium alloy Material. Plug and Play. Case Size: 122 x 74 x 14 mm. Fits 1.8" (standard size) mSATA drives Max out the USB 3.0 bus, real world speeds can top 200 MB/s Ultra slim profile, thin and flexible cable. Solid aluminum construction Chipset: ASMedia ASM1053 Create your own blazing fast external SSD with this USB 3.0 mSATA SSD enclosure. A USB 3.0 external SSD offers incredible performance far beyond that of a USB 3.0 flash drive. But "Samsung Data Migration" is not supported, because of "Samsung Data Migration" is used to clone the system. Not support ADATA SX7000 M.2280 and Samsung date Migration. External Interface: USB 3.0. Turn any 2.5" IDE hard drive into a USB 2.0 external hard drive Powered by USB, no external power supply needed LED power indicator changes color to indicate hard drive activity Fully Supported by Windows XP, Windows Vista, Windows 7, Mac OS X, and Linux, No drivers needed IDE drives are older and often require more power than a single USB port can provide. A two-headed USB cable is provided so that extra power can be drawn from a second port. Turn any 2.5" IDE hard drive into a USB 2.0 external hard drive. Transparent body design, convenient to use. Tool-free installation; hot-swap plug and play. Support system: windows 2000/xp/7/8/10/MAC9.1 or above. . Interior strap and zippered closure secures portable hard drive in place. The item shown in the pictures is the exact piece you will receive. In addition, with a corresponding USB-C to USB C Gen2 cable, the device is still backward compatible with the widely used USB 3.0 and even USB 2.0 technology. 1 x Nekteck USB C SATA Enclosure 1 x USB Type C to Type C Gen 2 Cable(USB-IF Certified 50 cm) 1 x User Manual. Enters sleep mode automatically after left unused for 30 minutes. 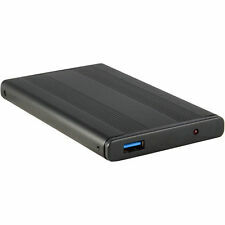 Western Digital Expansion Portable Hard Drive Enclosure USB 3.0. · 146mm x 101.6mm x 19mm (or 25.4mm) SATA Drive (Regular 3.5" Desktop Hard Drive). · Original Werstern Digital Enclosure. WORKS WITH ANY 3.5" HARD DRIVE (WD, Seagate, Hitachi, Toshiba, Samsung etc.). This adapter allows for flexible installation of an M.2 (NGFF) of different size like 42, 60, or 80mm in length with varying capacity. This M.2 adapter will give you the best performance possible for your system. There is better protection for your HDD SSD hard disks with precious data by application of its drawer function. 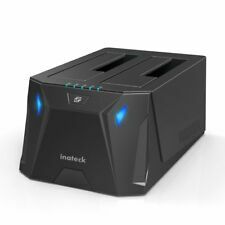 Type SATA to USB 3.0 HDD Docking Station. Portable enclosure with hollow design not only can make hard drive enclosure looks good, but it also can keep the drive cool, avoiding too hot if running for a few hours. HDD supported: 2.5"/3.5" SATA, STAT II, IDE HDD. Supports SATA 2.5" and 3.5" SATA &IDE hard drives without any adaptors. Supports one-button disk copy(clone function). 1 x SATA IDE HDD Docking. Fits 1.8" (standard size) mSATA drives. 2.5" 9.5mm (standard size) case. Converts 5V input power to 3.3V for the mSATA drive. Chipset: JMicron JM20330 Convert a mSATA SSD into a 2.5" PATA / IDE drive for use with an older laptop computer. An SSD upgrade will give the computer a dramatic performance boost. Assembly is simple. The assembled product is a standards compliant 2.5" drive, compatible with all computers that use a 2.5" PATA / IDE drive. . 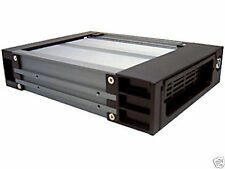 This aluminum hard drive enclosure is designed to wick heat away from your 3.5" SATA drive. Interface is SATA to USB 2.0 and eSATA. This unit features the new version SATA Sled connector. Actual item type is pictured. 1 x ORICO 2.5" Hard Drive Enclosure. The USB3.0 transfer rate may differ from different computers, systems and hard drives. Speed Test for Z97-K/8GRAM/Samsung 840 EVO 120GB SSD. Not including the hard drive,pls. The Sabrent DS-UBLK SATA Docking Station supports the direct insertion of Desktop 2.5"/3.5" SATA Hard Drives. It is a caseless solution that makes swapping hard drives easier than ever before. Connect any 2.5"/3.5" Serial ATA (SATA) or SATA II Hard Drive to your computer through an available USB 3. You had been planning a movie night for months and finally loaded up your portable disk drive, but trapped it in the car door and smashed it to pieces before you even left the driveway. You can easily find a protective external hard drive case for portable drives by the largest manufacturers such as Seagate, Samsung, and Western Digital. With a branded WD external hard drive case, you can be sure that your Western Digital disk drive is protected by a shock-absorbing sleeve, just in case you happen to drop or trap it. If you are often on the move, an external hard drive case bag can also help prevent damage to your disk drive by covering it with a protective sleeve, which is easy to carry. The sellers on eBay have an enormous inventory of sleeves, cases, docks, and much more, so you can be sure that you will find the perfect protective case for all of your peripherals with just the click of a mouse. With thousands of trusty vendors and plenty of shipping options, you can be sure that all of your purchases will arrive in a timely fashion, and you can get everything you need without another stressful drive to the store.